Sailing in the Cyclades is the dream of every sailor. 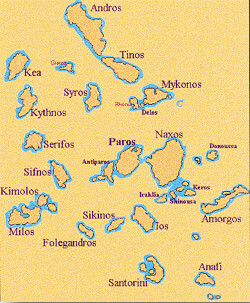 Thirty islands, the most of them famous worldwide, form a group called the Cyclades, because they are in circle (“kyklos” in Greek). Here the Meltemi blows strong up to force 8, especially in August, and the experienced and skilled sailor will enjoy the most exciting and demanding sailing, with long passages between the islands and unlimited itineraries to choose. Our magnificent islands of Mykonos and Santorini, Delos, Serifos, Sifnos, Milos, Tinos, Syros, Paros, Naxos, Kythnos and Kea, are the pearl of the Aegean. Each one of them has its own special character and beauty, white washed houses and churches surrounding sheltered fishing harbors with small tavernas serving excellent local wine. This is the place where the Dream of golden Sun, deep blue Sea and Sailing comes true. Suggested itinerary for one-week charter: Lavrion, Kea, Tinos, Mykonos, Siros, Kytnos, Lavrion. Suggested itinerary for two-week charter: Lavrion, Kea, Tinos, Myconos, Paros, Naxos, Amorgos, Santorini, Ios, Milos, Sifnos, Serifos, Kythnos, Lavrion. CYCLADES distance map in n.m.